Williston Park NY, U.S.A – It’s all about giving back. 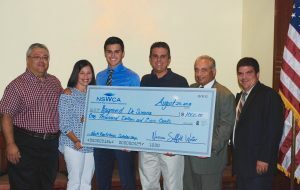 The Nassau Suffolk Water Commissioners’ Association (NSWCA) has awarded the 2018 Nicholas J. Bartilucci Manhattan College Scholarship to Raymond DeSimone of Carle Place, New York.The annual scholarship is open to entering freshmen enrolled full-time in any engineering degree program at Manhattan College. 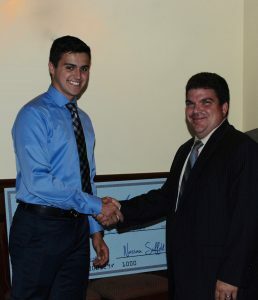 DeSimone, a Carle Place High School graduate, applied for and was awarded the coveted scholarship based on academic credentials and extracurricular activities. The award presentation ceremony was held at Angelina’s restaurant in Williston Park. President Abbatiello acknowledged the involvement and assistance of NSWCA Treasurer and Carle Place Water District Commissioner Lawrence F. Zaino, Carle Place High School Principal Thomas DePaolo, and Ms. Mary Ellen Malone, Director of Planned Giving at Manhattan College, all of whom were instrumental in the administration and selection process. Raymond’s parents, Richard and Karen DeSimone, were in attendance along with water commissioners from all districts. 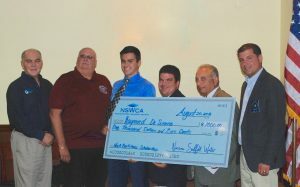 The NSWCA meeting was sponsored by Greenlawn Water District Commissioners’ John McLaughlin, Jim Logan and John Clark.